Came across a nice review of Bystander at the Reading Junky, a site written by a woman about to embark on her 36th year of teaching. They give out Purple Hearts for that, don’t they? 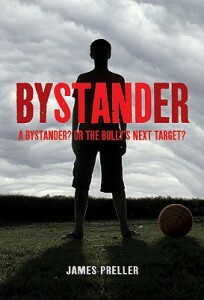 Author James Preller deftly handles a current adolescent concern – bullying. By breaking the stereotype of the rough, tough bully, and revealing a more devious variety, Preller’s story will make readers consider their own role in bullying situations.